The Detroit Toledo & Ironton Railroad was once owned and operated by Henry Ford. DT&I Coffee Mug with diesel and logo. 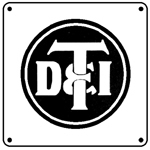 6 inch x 6 inch square tin sign of the Block Lettering logo used by the DT&I over the years. Henry Ford once owned the DT&I Railroad. 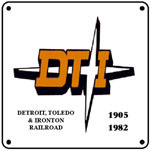 6 inch x 6 inch square tin sign when the Detroit, Toledo & Ironton RR was owned by Ford. Henry purchased it in 1920 for $5M and sold it in 1929 for $36M, after he improved it and brought it out of operational deficits. 6 inch x 6 inch square tin star/circle ogo sign of the Detroit, Toledo & Ironton Railroad. DT&I License Plate with famous star logo. At one time she was know as the Henry Ford Road.